Wow, you find such great documentation. The details here make fascinating reading. There is so much in each pension file. It really brings them alive for me. This was such a great read this morning…I find your historic information always interesting, and going back to see what you said in the past is like a gold mine. Thank you for doing an excellent job, and providing the facts with your own interests as well. You give me hope that doing genealogical research is worth while. If we don’t tell their stories and keep them alive, who will? I enjoy your stories too, even though if I’m on my phone, I can’t comment. What a fascinating account – there really are so many different directions you could go in imagining what life must have been like for them. Also, how cool to have a historical reenactor bringing your ancestor to life! The pension file is over 100 pages long and I have 6 or more newspaper articles. All of them were a real help in being able to imagine her life. I could well still have it wrong though. 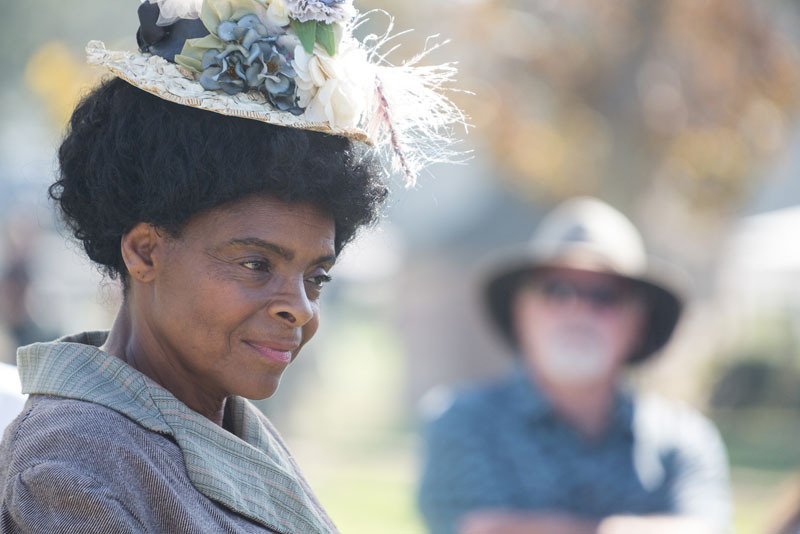 There is something so very beautiful about that photo, her expression, the feathered church hat. Lovely. I think it’s the second best thing to having an actual photograph of her. The actual voice, the actual words of a person, in this case, Amanda Cleage, never ceases to amaze me, as we hear her speaking to us over a century and more, and reaching back more than half a century to the days of enslavement. It is also wonderful that both Amanda and Abraham were brought to live in graveside reenactments. 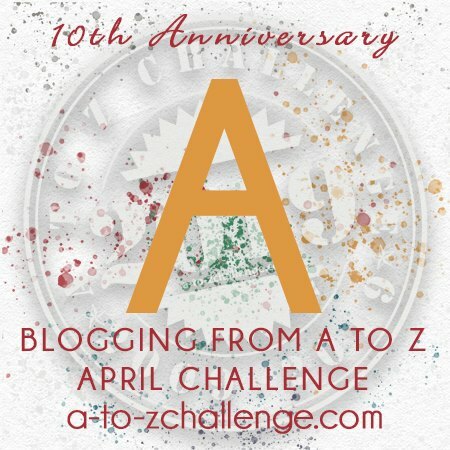 Congratulations on completing your first A-to-Z post! Yes, there is no substitute for having people speak for themselves. And it was a real thrill to have them brought to life. Even though it was much too far for me to go see them, two genealogy buddies did get to go see it. What a great story and follow up to past research. It is a tribute to your family that the historical society wants to bring Amanda and Abraham’s story to life with reenactment. I am working with an African-American woman who is tracing her line to a white Revolutionary War patriot for membership in DAR. You can guess where our stumbling blocks are. This post gives me ideas of where else to look. Finding proof of descent must be horribly difficult. I hope you can find some records to help. Great post. How cool that the historical society does a reenactment of your ancestors! The pension deposition has wonderful information in it. When I discovered those files with the depositions, I was amazed and thankful. The first one belonged to my grandmother’s uncle. I did the 2017 A-Z using that one file. I can never go beyond the fascination of these original documents. It really is like hearing these people talk to us. In 2015 you wrote “It is likely that they took a train.” the extra details you have uncovered through the pension file are marvellous. I did get answers to my questions and more. Leaving me with a different set of questions. What a wonderful continuation for AtoZ 2019. Excellent writing and portrayal of the era and persons involved. The deposition is incredible as a historical document and account of life at the time. I look forward to more during this AtoZ 2019 challenge. I am adding you to my Blog Roll…don’t want to miss any of your posts. Thanks for stopping by so I could visit your blog. Thanks for the blog roll add! How do you access such detailed documents? Really amazing! This was part of Amanda’s application for a pension from the U.S. government as the widow of a Civil War soldier. The files are a wonderful source of information. Neighbors and family members, sometimes members of the family that enslaved them give testimony about their lives. Abram’s and Amanda’s file contained more than 100 pages. This is just beyond fascinating, Kristin. And poignant. Such rich details of a life. Did she get her claim? Yes she did. And no fellow members of the plantation community came forward to caste doubt on the marriage. Abram had also talked about their marriage in his application for pension. Kristin this post is truly amazing! It brings the hidden history of the McMinn County in which I live to stark reality! Thank you again and again for sharing with us this wonderful research! Such an amazing glimpse back into the past. I had no idea such records would be so full of personal details. Really enjoyed reading about the collaboration, reenactment, and the Civil War Pension Files that give a glimpse into the lives of your ancestors in Tennessee. What’s remarkable is that the amount of detail contained in these pension files can still lead to reconnections in the present, even though the connections were missed after the war. What a wonderful post, Kristin! Pension files are so amazing; I so wish I had just one, somewhere in my own family history! Your yearly commitment to the A-Z project is so inspiring! Keep up the great writing!